In 2009, shortly after I had lost Miss Kitty, my white Angora, my daughter, who lives in a huge apartment complex in Tulsa, Oklahoma, brought me a stray cat that was hanging around outside her apartment. 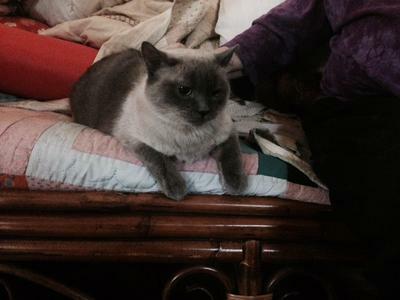 She was a beautiful blue-point Siamese cat with white stockings (as I thought then!) and intensely sapphire-blue, slightly crossed eyes. Next day the veterinarian confirmed what I had suspected - the cat was pregnant! Three kittens, he thought. So the kitty ‘laid in’ in my daughter’s old bedroom. 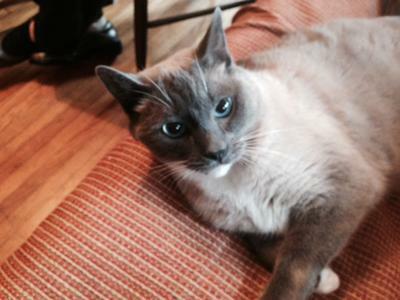 We immediately decided to call her Pippi II, a namesake for her childhood blue point Siamese mix, Pippi Longstocking. After a couple of weeks, Pippi II gave birth to two girls and a boy. One of the girls was a blue point Siamese; the other girl and the boy were (as I later learned) Snowshoe like their mother. My husband and I immediately decided we would keep all of them. We couldn’t stand to see the family broken apart. Pippi was an excellent mother and the babies grew up quickly, climbing up our pant legs and scaling dressers in order to tear wallpaper off the walls! It took considerable discussion to find names for the babies. Finally, my daughter, who had read all the Pippi Longstocking tales as a child, researched the spunky little girl from a series of books by Astrid Lindgren. She found that Pippi had several middle names, among them Delicatessa, Windowshade, and Mackrelmint. So the girls were named Deli(catessa) and Winnie (Windowshade), and the boy was named Mackie (Mackrelmint). Now, five years later, we have this precious family pictured here. Pippi is an in-and-outside cat, at her insistence. The ‘babies’ are completely indoor dwellers. Pippi raised her babies well and has remained aloof to them for their adult years, boxing them if they try to get to the food bowl when she is eating. Just recently though, she has mellowed and can sometimes be found sleeping close by one of them. My husband and I have mused about the sire of Pippi’s family. Because the three are so fully Siamese and Snowshoe, we think the kittens’ father was surely a purebred, but who knows? We theorize that Pippi was bred, but then left her owners’ premises. She does have a wanderlust; once or twice a year she sneaks into the upstairs apartment of our neighbor’s garage and gets locked in for one or two days! Each kitty has his/her distinct characteristics and personalities. Mackie is a very tall guy who prefers to sleep on Grandma’s lap. Both girls have broken joint crooks (kinks) in their tails. They cozy up together, wash each other and sleep with Grandpa. Neither of the Snowshoes has the inverted V on the face, though Winnie does have a white streak on her nose. Mackie and Winnie, the Snowshoes, have angular faces and leaner bodies. 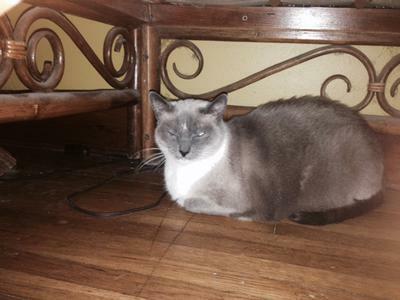 Deli, the blue Siamese, has an apple face and a solid, muscular body. They all three talk quite a bit; Deli sounds like an old-fashioned screen door that needs to be oiled. These cats are warm weather lovers. We suspect they curl up with us partly because they crave warmth. In the colder months, if not on one of us, these kitties choose a floor furnace grate to stretch out on, wash, soak up warmth or sleep cozily. We have made the decision to live in a ‘hairier’ environment than we used to when our pets lived outside. (I purchase more lint rollers!) My husband is retired and home by himself while I am still working. Our cat family definitely keeps him company and lifts his spirits. These kitties bring us so much joy! Thanks so much Caroline (great name by the way!) for your lovely story. Pippi and the kittens were certainly very lucky the day they found you and it sounds as if they're all very much-loved family members. I love their names. I've never read the Pippi Longstocking books, but have always meant to so I shall now make a point of doing so. I also loved your description of Deli's voice as sounding like an old-fashioned screen door that needs to be oiled - I think many Siamese cats do sound like that! I hope they all have a long life with you but short or long, I'm sure it will be a very happy one.